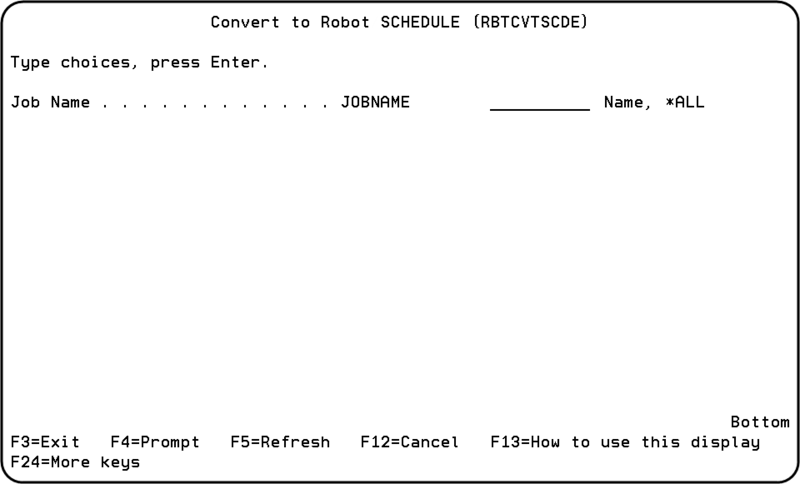 The following describes how you can convert your basic IBM Job Schedule jobs to Robot Schedule jobs. It provides complete instructions and items you should be aware of as you perform the conversion. Before you begin the conversion, back up the Robot Schedule product library (ROBOTLIB by default). Note: Substitute your product library name for ROBOTLIB in the above command if your product library has a different name. Press F4 to display the command prompt panel. Enter the name of the job you want to convert, or *ALL to convert all jobs. Note: You must be on Robot Schedule R10M00 to R12M00 to follow these steps. Contact Technical Support to get the SAVF file required for the conversion. Before you begin the conversion, back up ROBOTLIB. When you are ready to start the conversion, create a save file named RBTSCDESF on your system. FTP the save file you received from HelpSystems to the RBTSCDESF save file on your system. Restore the library RBTSCDE from the save file. Add the library RBTSCDE to your library list. The RBTCVTSCDE command allows you to convert all jobs (*ALL) or a single job by Job Name. You must have *ALLOBJ, *JOBCTL and *SECADM special authorities to run the conversion. Robot Schedule Auditing must be on before converting. If it isn’t, the conversion will end in error. Converted jobs are added to Robot Schedule. The conversion does not update any existing jobs. If you run the conversion multiple times, the jobs will be added multiple times. You can use Robot Schedule to remove or modify any of the converted jobs. All jobs are converted to Command Type jobs and have a Schedule Override Code of Hold. New jobs created in Robot Schedule will be assigned the following applications: IBMSCDE for jobs that are released, and IBMSCDE_H for jobs that are on hold in the SCDE. The conversion creates a log file that contains information such as who ran the conversion, when it was done, and the options that were entered (job name, application name, library). If multiple conversions are done, the log file will contain multiple records. No job history information will be converted. The conversion also creates exception reports and an error file. The error file (RBTCSCDERR in RBTSCDE) is cleared each time the conversion is run. The following shows how jobs will be converted for each frequency of job entries. Jobs will be converted to jobs with an Advanced Scheduling type of DATE. The Date object will be created as ‘D’ + IBM job entry number. If the Schedule date is NOT within the current week, this job entry is converted to a job with an Advanced Scheduling type of INDAY, and with a starting date of Next Submit Date from the job entry and will run every 7 days thereafter. If the Schedule day is *ALL, the job is converted to a job running every day of the week. If the Schedule day is *MON, *TUE, *WED, *THU, *FRI, *SAT, or *SUN, the job is converted to a job running on the specified day of the week. If there is an omit date in the job entry, the conversion creates a Date object with Type 2 Exception Dates. The Date object name is Dxxxxxx, where xxxxxx is the job entry number. The Date object will be attached to the job’s Exception Scheduling Objects. *MONTHSTR is converted to a job with Advanced Scheduling type DAYNO. The Day number is set to 1 and the type of day is Calendar. *MONTHEND is converted to a job with Advanced Scheduling type DAYNO. The Day number is set to –1 and the type of day is Calendar. A valid date is converted to a job with Advanced Scheduling type DAYNO with the date number; the type of day is Calendar. If there is more than 1 Relative day of the month, the job is converted multiple times, based on the number of entries in Relative day of month. Each converted job has the same job name and job attributes. For example, job entry AA0 has a Schedule day of *TUE and *WED and 1, * LAST in Relative day of month. After conversion, there will be two AA0 jobs: one AA0 job will have a 1 on Tuesday and Wednesday on the Initial Job Setup panel, while the other AA0 job will have an L on Tuesday and Wednesday on Initial Job Setup panel. The run time from the original job will be used to schedule the job in Robot Schedule. You should review each converted job to make sure that scheduling is set up correctly. Keep the following in mind. Date Objects: Check to see if the dates in the date object can be changed to use the DAYNO scheduling code or OPAL. Job Setup: Converted jobs have the Output Queue set to *JOBD, Message Reply set to *JOBD, and Accounting code set to *USRPRF. IBM job schedule entries do not provide these job attributes. These values are different from the default values used when you create a new job in Robot SCHEDULE. Review your new job Control Options and make changes as needed.